Do you remember when 1 cent would actually buy you a piece of gum in the gumball machine at the grocery store? A little before my time there was also penny candy. It’s been years since those copper colored coins meant much to anyone. I remember in high school seeing them on the ground and walking past them. My friends and I thought “Find a penny pick it up..” but instead of the “and all day you’ll have good luck” part of the line – we said eh….keep walking…. The penny (or at least this one) has found a way to show everyone that a vintage penny can certainly shine again. This particular coin was actually a mistake. It was struck in a copper alloy in 1943 and is the only known “mistake of this kind” out there. It was sold by a New Jersey coin dealer, Legend Numismatic (www.legendcoin.com) for $1.7 million dollars. And to show a penny can still be lucky, the proceeds went to charity. In 1943, zinc coated steel was being used for pennies instead of copper. Copper was being used for war efforts. The collector who purchased the penny noted he has searched for this coin for a very long time. He began collecting coins as a teenager and at one point, thought he had found the elusive penny but learned it was a fake. 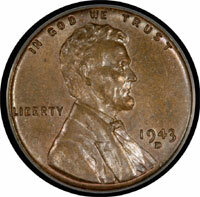 Now, he has an example of every mint 1943 bronze cent produced. I would strongly suggest you check your pockets daily to see what coins might have been given to you throughout the day. There are numerous websites that will offer pricing on coins for free. It could certainly be worth your while to investigate that spare pocket change which might be worth YOUR weight in gold.